Actress Amy Locane-Bovenizer, who most remember from the original Melrose Place, but to me will always be Allison, the true love of Cry Baby Walker, has gotten herself into a bit of trouble. It seems Locane, 38, had way too much to drink the other night and smashed into a bunch of things – and a couple of people. 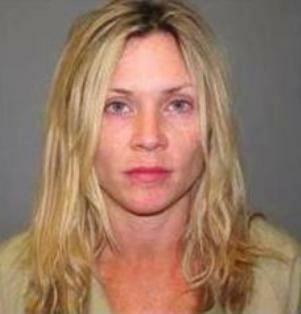 According to court documents, Amy Locane was driving a Chevy Tahoe in Montgomery, N.J. at 9:05 p.m. on Sunday night when she struck the passenger side of a Mercury Milan as it was turning into a driveway. Helene Seeman was pronounced dead on the scene, while her husband Fred Seeman was airlifted to New Brunswick’s Robert Wood Johnson University Hospital; he is listed in critical condition. Several witnesses saw the actress swerving in the road, hitting cars, and knocking over mailboxes shortly before the fatal crash. Locane reportedly told authorities that she drank several glasses of wine before getting into her car; blood alcohol testing was conducted at Princeton hospital. Amy Locane was arraigned on Monday at the Somerset County Courthouse where she was charged with second-degree vehicular homicide and DUI, as well as third-degree assault by auto for rear-ending a different car shortly before crashing into the Seeman couple. Bail was set at $50,000. If convicted, Amy Locane could get up to 10 years in prison. As if all that wasn’t horrible enough, Amy Locane-Bovenizer is married to Mark Bovenizer – the owner and operator of Community Liquors in Princeton, who teaches wine seminars at Princeton University and Harvard Business School; Bovenizer is also a wine educator at the Carlow Cookery in Doylestown, PA. The couple has two daughters, Paige 3, and Avery, 1. And now I present to you Amy Locane and Johnny Depp, in a particularly hot and cheesy scene from the John Waters masterpiece, Cry Baby…..”Why Cry Baby? Why?”…..